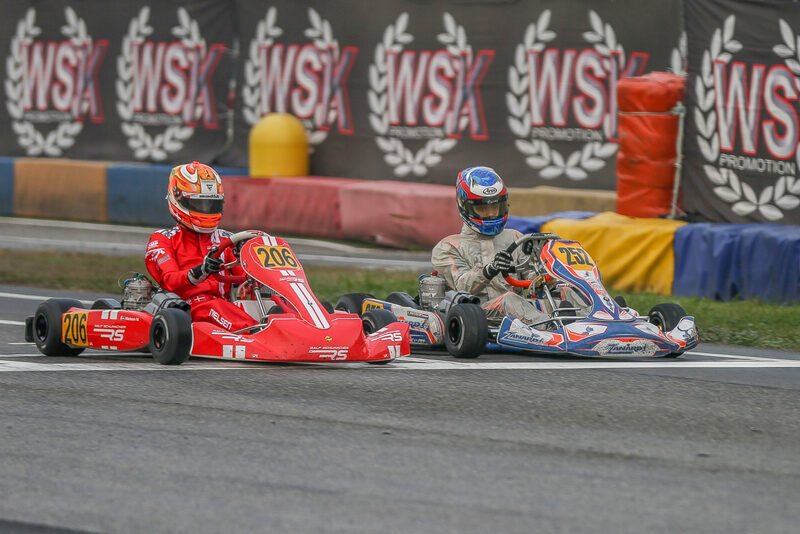 Heavy clouds, rain, and a slippery track were on the menu this Friday for the 192 drivers taking part in the second round of the 2018 WSK Final Cup at Castelletto di Branduzzo. Following the Qualifying sessions, the first round of Heats has taken place on the 7 Laghi Karting Circuit. 206,Nielsen Nicklas(DNK),Schumacher racing team(PRAGA/VORTEX/BRIDGESTONE), 252,Haverkort Kas(NLD),Zanardi racing team(CRG/TM-RACING/BRIDGESTONE), Castelletto, 11 November 2018. WSK Final Cup, © 2018, Alexandros Vernardis / The RaceBox. The 57 drivers in the OKJ class were met with rain and tricky conditions to open the Qualifying festivities on the 7 Laghi track. But it didn’t prevent the tension from rising between the category’s contenders. After battling against the KR drivers, Parolin’s Gabriele Mini’ improved in the last two minutes of the second series to clinch the fastest lap in front of Kimi Andrea Antonelli (KR-Parilla), Kai Askey (FA Kart-Vortex), James Wharton (FA Kart-Vortex) and Lonato’s winner Taylor Barnard (KR-Parilla). Coming to the racing, Antonelli (KR-Parilla) kept his momentum going in the C-E Heat to grab the win all the way from first place on the grid, in front of Askey and Rafael Camara (Birel ART-TM). The second confrontation (B-D) allowed Kirill Smal (Tony Kart-Vortex) to dominate the opposition lead by Wharton in second position and Nikita Artomonov (Tony Kart-TM) in third. Missing the top 3 were Dilano Van’t Hoff (Exprit-TM) and Barnard. OK: The battle is on! Despite the rain and slippery conditions, Lonato’s winner Lorenzo Travisanutto (KR-Parilla) set the fastest lap (1:02.719) in Qualifying in front of Nicklas Nielsen (Praga-Vortex) and Gabriel Bortoleto (CRG-TM). After falling short to steal the best spot on the grid, the KSM Schumacher driver took revenge by dominating the first Qualifying Heat (A-B) disputed on a slowly-drying track. Kas Haverkort (CRG-TM) saved the second place ahead of Harry Thompson (FA Kart-Vortex) while pole-sitter Travisanutto (KR-Parilla) finished fifth behind Leandro Anderruti (KR-Parilla). The second Heat in the class (C-D) saw the win of Viktor Gustafsson (Kosmic-Vortex), one second clear from Zane Maloney (FA Kart-Vortex) and Bence Zsombor Kovacs (Praga-Vortex) completing the top 3 with Bortoleto (CRG-TM) finishing fourth. Divided into three series, the Qualifying session in the 60 Mini class went through improving weather conditions that allowed Brando Badoer (Parolin/TM) to grab the pole position (1:09.204), half-second faster than Keanu Al Azhari (Parolin/TM) followed by Alex Powell (Energy/TM). The young Jamaïcan, winner in an impressive fashion of the first round in Lonato, kicked-off things well by winning his first Heat (B-D) with Koskun Irfan (Parolin-TM) coming home in second place ahead of Belgium’s Ean Eyckmans (Parolin-TM), while Al Azhari lost three positions to edge the top 5. The second Heat of the day (C-E) smiled upon the Russian Dmitry Matveev (CRG-TM) with Christian Bertuca (Parolin-TM) and Kirill Kutskov (Parolin-TM) respectively second and third. Attending the Final Cup for the first time this year, Adrian Renaudin (Sodi-TM) took pole position in the KZ2 class, setting the fastest mark in 1:01.550 with his CPB sport’s teammate Ariel Levi (Sodi-TM) edging him on the first row of the grid. The first Heat of the gearbox category went to another Frenchman, Emilien Denner (Kalikart-TM), who recovered well from P6 to grab the win, before being handed a post-race 3-second penalty for an incorrect position of the front fairing. Axel Bengtsson (Kosmic-Vortex) inherited the win in front of Renaudin (Sodi-TM) and Denner falling back in third. The second day of the 2018 WSK Final Cup’s round 2 on the 7 Laghi kart circuit in Castelletto di Branduzzo will kick off tomorrow at 8:35 with the first warm-up sessions followed from 10:10 by the next rounds of Qualifying Heats.